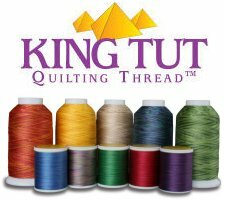 King Tut Thread is the highest quality natural quilting thread. King Tut Thread is made of low lint 40 weight extra-long staple Egyptian cotton. King Tut Threads #1004-1035 are being discontinued and will become harder to get as time goes by, so hurry if you need one. New King Tut Threads #1036-1067 are available here now!